The Daily GRRR! HEADLINES for February 13th, 2015. 1. Family Day Rally At Lindsay’s Immigration Jail. 2. Breaking: American Jails Are Being Overused. 3. London’s Prisoners Justice Film Festival is Seeking Support. 4. Judge Dismisses Anti-Protest P6 Charges. 5. Mental Distress and Police Causing Death in BC. 6. 2 Brant County OPP Charged In Car Chase Death. 7. RCMP Illegally Took Guns From Homes After Evacuating Residents. 8. McGill Profs Attempt To Avoid Scrutiny Over Military Contracts Through Shell Companies. 9. Continent-Wide Ceremonies and Demonstrations for Missing and Murdered Indigenous Women. 10. 4 Decades Since Arrest of Political Prisoner Leonard Peltier. Welcome, I am your host Dan Kellar and you are listening to The Daily GRRR! Waves Through Walls: Prison Radio, on 100.3fm, CKMS in Waterloo, Ontario. Soundfm.ca on the web, today is Friday February 13th, 2015. The clip that kicked off the show is from Mumia Abu-Jamal with his piece entitled Obama and Black History Month . Check prisonradio.org for more of Mumia’s podcasts. This Family Day holiday, hundreds of southern ontario residents, led by high-school aged youth from Peterborough and Toronto, are expected to convene at the Central East Correctional Facility in Lindsay, Ontario - to demand justice for the migrants being held in cages in this maximum security jail. This latest demonstration is part of an ongoing campaign which started in 2013 to end maximum security detention in provincial jails for migrants; follow international norms and ensure a limit of 90 days that migrants can be held in detention pending deportation; and to overhaul of the flawed detention review process. Siblings, parents, friends and grandparents of the youth group, as well as family members of many of the men imprisoned by immigration enforcement will be raising signs and making music outside the prison walls during the day and hope other folks will join them. The VERA institute of Justice, a US non-profit, has released a study detailing the overuse of jails in America detailing a shift from jailing only high risk suspects during the pre-trial phase to a debtors prison for people too poor to post bail. All in all, more great evidence to abolish the current prison industrial complex. 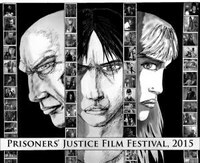 The 3rd Prisoners Justice Film Festival is taking place starting March 8th in London, Ontario and event organisers have launched an indiegogo campaign to gather a little extra financial support to ensure an amazing and accessible event. ‘We prioritize making the event free since many people most affected by the Prison Industrial Complex have limited money. It is also important to us to be able to rent accessible spaces and to pay for professional ASL interpretation.” Childcare will also be available at the venues. A judge has agreed with protesters who were charged under Montreal’s controversial P6 by-law which was enacted to silence dissent during the 2013-2014 student uprising in Quebec. Noting that the police falsified evidence, among other violations, Judge, Randall Richmod acquitted 3 defendants and paved the way for dropping the charges on the 1200 or so other people who were targeted in the draconian measure. P6 sought to criminalise protests that were not registered beforehand with the police. ASSE quoted Judge Randall in their press release who said “the trivialization of this violation of the law by senior officers of the police department of the City of Montreal is staggering. Not only does the ordered procedure risk convicting the innocent, it seriously undermines the confidence we can have in the documentary evidence that is used every year in thousands of penal prosecutions." This investigative series from the Georgia Strait comes on the heels of a string of bloody incidents involving the police at the end of 2014. In November 2014, after Victoria police shot and killed 21 year-old Rhett Patrick Victor Mutch, who was threatening self-harm, the Vancouver police shot and killed Phuong Na Du within a minute of arriving on the scene. Du was hitting a fence with a 2x4 before he was shot and the Strait reports that the 51-year-old man’s friends said he was struggling with a mental-health issue. Additionally, Surrey Transit police killed Naverone Woods on December 28th. The cbc reports that the 23-year-old First Nations man was reportedly distraught and was also inflicting self-harm. The head of the Vancouver police mental-health unit admitted that the numbers do not surprise him. Clearly the VPD is not equipped to deal with the complexities found in the modern world. Following an investigation undertaken by the SIU, OPP Const. Craig McMurtrie and OPP Const. Rodney Donald Grubb have been charged with criminal negligence causing death, dangerous driving causing death, and one count of conduct likely to constitute mischief causing actual danger to life. In a move quite out of character for the agency,the SIU has decided that the 2 cops who left their RIDE check in wild pursuit of a truck that eventually plowed into the car of 18-year-old Ashley Lerno, killing her, likely committed criminal offences. This is the second time cops roaming brantford streets have been in the news recently after the SIU re-opened the case of 18-year-old Evan Jones. Jones was killed by Brantford police Const. Adam Hill on Aug. 25, 2010 while experiencing mental-distress. In this case the SIU has received “Materially new information” about the shooting. High River was mostly evacuated amid flooding in June 2013, however dozens of residents stayed in their homes, which the RCMP say prompted the need to start entering the empty homes to seize guns. The report notes that if the cops told a judge of the seizure of more than 600 guns from just over 100 houses it would have been more acceptable, but they also did not follow other guidelines. special forms to ensure better note-taking about forced entries. A student-led organisation at McGill university in Montreal has revealed that professors connected to the Shock Wave Physics Group in the Department of Mechanical Engineering at the school have been setting up shell companies based at their homes in an effort to avoid regulatory and public scrutiny as they undertake weapons research at the institution. The research revealed that nearly a million dollars has been sent through two of the shell companies since 2009, with one quarter-million dollar contract still active. Marches, Demonstrations, and Ceremonies will be taking place across Turtle Island over the next several days to honour, remember, and seek justice for the 1200+ missing and murdered indigenous women in so-called canada. In Vancouver, this will be the 25th annual march and the organisers call people to “come together to grieve the loss of our beloved sisters, remember the women who are still missing, and to dedicate ourselves to justice”. Last Friday, February 6th marked 39 years since the colonial states of america and canada successfully colluded to apprehend Indigenous activist Leonard Peltier. Peltier was convicted of killing 2 FBI agents in a shootout on the Pine Ridge reservation in 1975, crimes from which he maintains his innocence. “Amnesty’s numerous concerns include coercion of an alleged eye-witness whose testimony was used to obtain Peltier’s arrest and extradition, and the prosecution’s withholding of evidence that may have altered the outcome of his trial. Furthermore, the justice system has failed to address these breaches whether through a retrial or through the parole process. Amnesty International also remains deeply concerned that the treatment of Leonard Peltier in the US justice system may have been influenced by political factors, including the tense relations between AIM and the FBI at the time of killings. You are listening to Waves Through Walls edition of The Daily GRRR! Today is February 13th, 2015, my name is Dan Kellar and we are now moving into the feature portion of our broadcast. Today’s feature is political prisoner Jaan Laaman reading his essay which reflects on Resistance, Struggle, Death, and Incarceration. That was political prisoner Jaan Laaman reading his recent essay reflecting on Resistance, Struggle, Death, and Incarceration.